February 2nd is the feast of The Presentation of the Child Jesus in the Temple, the Purification of Our Lady and the last day of the 40 days of Christmastide. “Forty” is a powerful symbolic number in the Bible. It carries the force of God’s eternity within our time – days, weeks, years. It is not calendar time, it is symbolically time’s relating us to God’s eternity, outside of time. The Church celebrates 40 days of Lent (Ash Wednesday – Holy Saturday), Eastertide (Easter Sunday – Ascension) and 40 days of Christmas (25th December – 2nd February). The Presentation and the Purification’ are in the Old Testament Law – 40 days after the birth of a boy, 80 days the birth of a girl. The purification was considered necessary because of the shedding of blood in the giving of birth. The mother, newly purified, was welcomed back into the prayer community. The Catholic Church echoed that ritual in a ceremony call “Churching” and I remember my puzzlement when my family talked about new mothers needing to be “churched” after childbirth. I thought motherhood was wonderful – why did the mother need to be purified/blessed before being welcomed back to church? “Blood” was the disappointing answer. The Christian Church had carried Old Testament ritual into the New Testament. Childbirth, somehow, made a woman unclean! No, it makes her even more wonderful. The ceremony does not now exist. Peculiar thinking saw Old Testament uncleanness in childbirth. Now we celebrate the birth of a child and mother and fatherhood in the baptism ceremony. There is more, you say. Our Lady did not need to be purified. 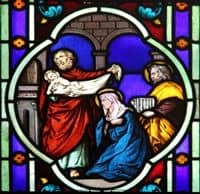 She did not shed blood in the wonderful giving of birth to Jesus. Hers was a virgin birth – a second miracle to complement the virginal conception nine months before. That is the teaching of the Catholic Church: “Before, during and after giving birth you remained a virgin, O glorious mother” is a prayer in the Church’s prayer book for Our Lady’s feast days. Before, during, after. Explain that to our Christian brothers and sisters in the other Churches – and then the virginal marriage she and Joseph lived lovingly. Be careful how you explain. It is the Church’s teaching.